April No Falls is an international campaign, which aims to educate and raise awareness of falls prevention and help those at risk of falling to stay on their feet. The 2016 theme focuses on falls and prevention strategies. 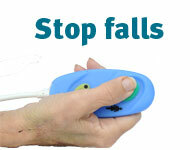 Below are a number of promotional materials for healthcare organisations to use to promote April No Falls. To order Stay On Your Feet® resources to go the seniors resources webpage.